There’s something about heading into the wild outdoors with no roads, no cars, just the water, rainforest and a paddle to get you back to civilisation. Eco Rafting are a small family owner-operator business with over 20 years experience rafting the West Coast river systems. Co-owner Kristen James says their season has just kicked off and rafting is a great way to get away from it all. 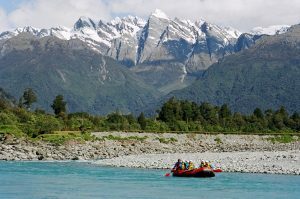 The West Coast is the white water capital of the world with well over a thousand rivers and creeks flowing off the Southern Alps. Eco Rafting offer several different types of rafting tours for every level of experience including multi day adventures and heli-rafting, all taking place amidst stunning scenery.